Procaccini’s shallow, claustrophobic composition—with threatening faces half hidden in the shadows—pushes this scene outward, off the canvas. 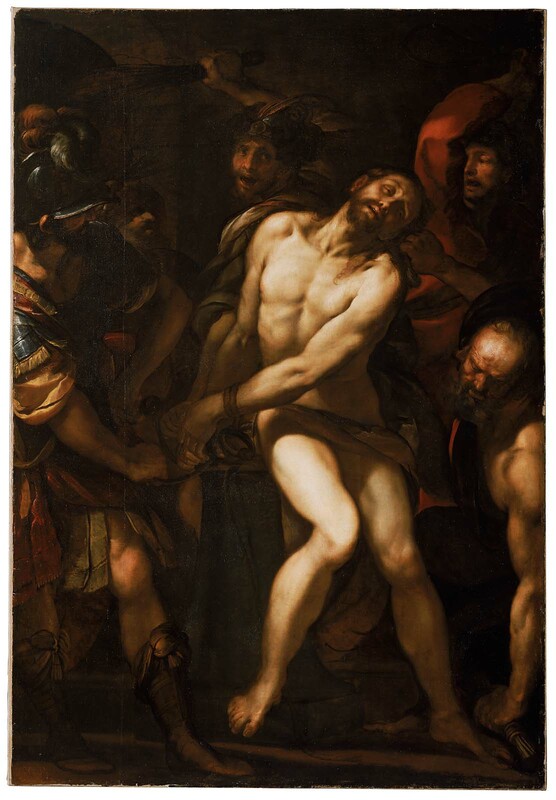 In 17th-century Italy, paintings like this were meant to confront viewers with Christ’s suffering and inspire emotion (and devotion). Here the artist emphasizes the tortured Christ’s agony, bathing his twisted body in cold, harsh light. Odette d'Albo, "I Governatori Spagnoli a Milano e Le Arti: Pedro de Toledo, Giulio Cesare Procaccini e le 'Historie Grandi della Vitta di Nostro Signore,' " Nuovi Studi 20 (2014): 145-164, has suggested that the MFA painting is one in a series of thirteen canvases depicting the Passion of Christ, commissioned by Pedro de Toledo Osorio from Procaccini. The commission is mentioned in a letter from Fabio II Visconti Borromeo to Giovan Carlo Doria (January 31, 1616); and the group of paintings is mentioned in Osorio's inventory of 1625 and in a posthumous inventory of about 1627.